I was determined to rise to the challenge when the speaking time limit was cut from 7 minutes to 4 minutes in today’s Aviation Strategy Debate. It was almost as if repeated interventions from Bernard Jenkin, described as the only other person mad enough to support Boris’ scheme, were designed to time me out! Thankfully our excellent Deputy Speaker Lindsay Hoyle managed to get me in to speak (not sure if this meant cutting short Adam Afriye instead). I was short of breath by the end. However, I hope that years spent living and breathing opposition to an Estuary Airport meant I was able to get in most of the key points. Mark Reckless took the opportunity during today’s Prime Ministers Questions to highlight Boris Johnson’s own admission that his pie in the sky Boris Island scheme lacked any credible support further to Sir Howard Davies’s indication that some plans will not pass first base environmentally. 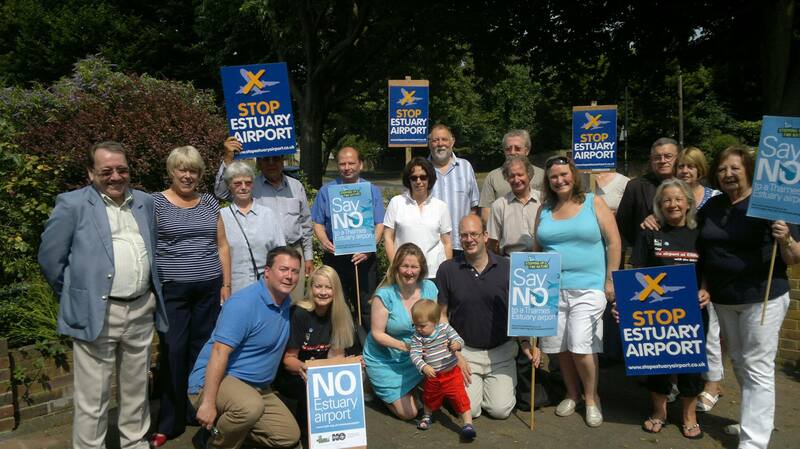 Rochester and Strood says No Estuary Airport! 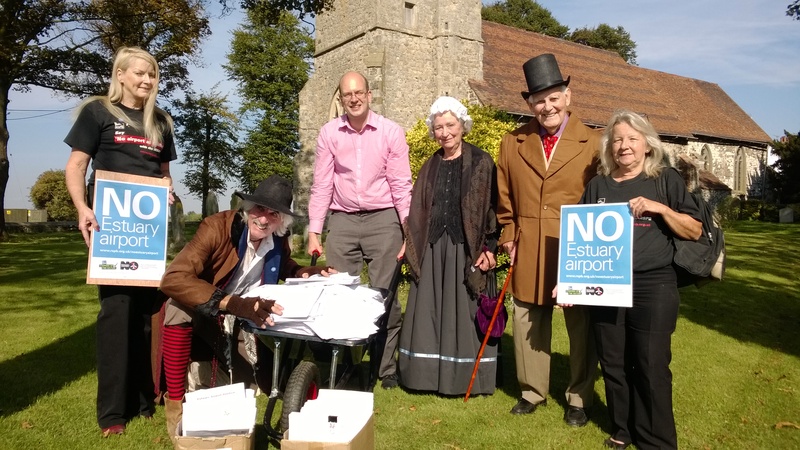 Mark Reckless, MP for Rochester and Strood, today joined local residents and campaigners at St James’ Church in Cooling to reveal the results of his No Estuary Airport ballot prior to making his submission to the Davies Aviation Commission. Over the past seven months, residents across the Rochester and Strood constituency have been asked for their opinion on whether or not they support the proposals to build a new hub airport in or around the Thames Estuary. The results are (wheeled) in… Rochester and Strood says No Estuary Airport! The response has been extraordinarily good. Just under 8,000 residents took the time to have their say on the plans, and the answer has been a resounding ‘NO’ to proposals put forward for a Thames Estuary airport including by Boris Johnson and Foster+Partners. 92.6% of residents across the constituency do not support the proposals, with just 7.3% in favour. In Strood Rural and Peninsula wards, which would be most impacted by a new airport, the figure was even higher with 94.4% of all respondents saying ‘NO’, with just 5.5% supporting the plans. Across the rest of the constituency, excluding Peninsula and Strood Rural wards, 87.8% of local residents oppose the plans, with 12.1% in favour. “These proposals are, economically, completely unjustified. It is going to cost, perhaps, up to £100bn, and much of that will be government-guaranteed money, while all of the other proposals will be, in the main, privately funded. I just don’t believe it’s a credible proposal which merits further investigation. That’s what I said to Sir Howard Davies when I met him a week or so ago, and this ballot shows the strength of feeling against the proposals here in Rochester and Strood. 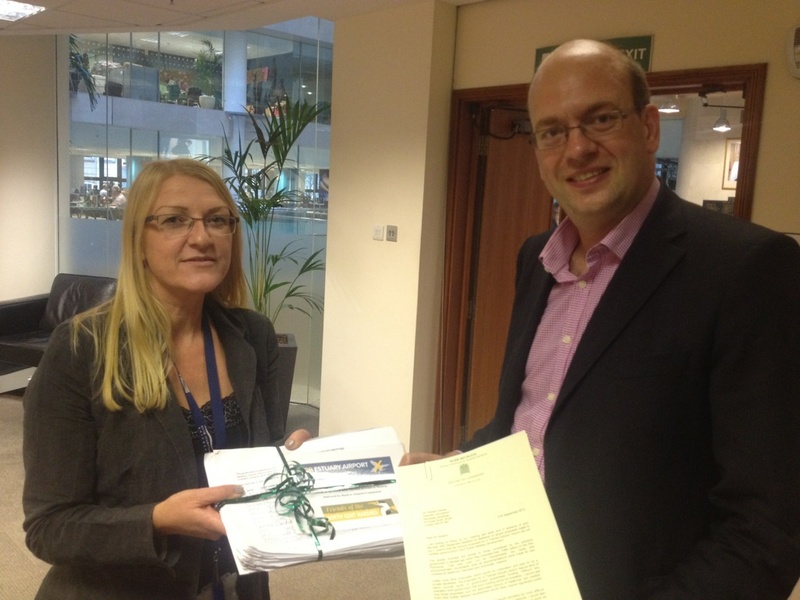 Mark Reckless also accepted for submission to the Davies Commission a 1,800+ strong petition against the Thames Estuary Airport on behalf of the Friends of North Kent Marshes (FoNKM). 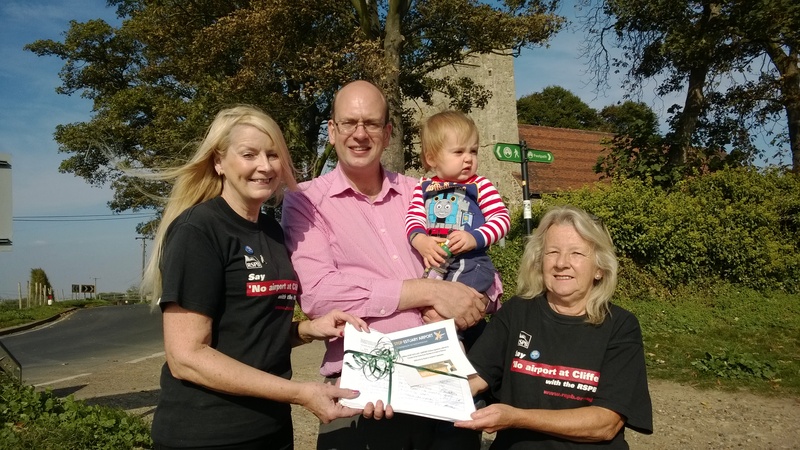 Following the huge response from residents living on the Hoo Peninsula, Mark Reckless MP has launched his No Estuary Airport petition to the rest of the Rochester and Strood constituency after months of planning and campaigning. Mark Reckless was joined by local residents, activists and councillors in Strood for the launch of his extended campaign on Sunday 14th July to help distribute thousands of ballot papers to local residents, inviting them to finally have their say on a possible airport in the Thames Estuary region. “The Mayor of London initially proposed building an airport on an artificial ‘Boris Island’ north of the Isle of Sheppey, which he was then forced to rule out. Now he’s saying he supports Lord Foster’s proposal to build an airport over the north-east of the Hoo Peninsula and reclaimed land beyond. Boris, like his pie in the sky airport fantasy, is all over the place. Many of us remember the No Airport at Cliffe campaign and how the Hoo Peninsula came together ten years ago to defeat the then government’s plan for an airport at Cliffe. While there is no similar proposal from the government this time, the independent Davies Commission, which is looking into the issue of airport capacity in the South East and which recently accepted my invitation to tour the Hoo Peninsula, will be producing an interim report later this year and a final report in 2015. Sign The Petition Online – Click Here or email Mark Reckless if you would like to help with the campaign. Mark Reckless, MP for Rochester and Strood, questions the Mayor of London, Boris Johnson, over his pie in the sky Boris Island proposal and receives a surprising response. The Mayor of London and Foster & Partners are not the first to suggest building an airport in the Thames Estuary. The last government did that with Cliffe airport. That was ruled out, not least on grounds of cost, and these latest reheated proposals lack feasibility just as their predecessors did. Despite Boris’ gung-ho attitude, support for a Thames Estuary airport remains extremely limited. The substantive report by the Transport Select Committee, published on Friday, which drives a coach and horses through the proposals, follows hot on the heels of the London Assembly’s findings that a Thames Estuary airport is not a viable option. By advocating the Thames Estuary airport, Boris wanted to take the focus off Heathrow expansion, but by backing such an ill-advised, economically and environmentally unfeasible scheme he only succeeded in putting the focus back on Heathrow, although other options may make more sense. I welcome the decision by the Transport Select Committee to reject a new hub airport in or around the Thames Estuary. It is a huge boost for the thousands of residents across Medway, particularly those living on the Hoo Peninsula, who are opposed to such proposals. However, it is important that we stay focused on our ultimate goal of seeing off these pie in the sky plans once and for all. With cost estimates ranging widely from £70-100 billion, this scheme would not only have added at least £50 to each plane ticket but would also require huge swathes of public subsidy, money which we simply do not have. Not only would the estuary airport impose a massive financial cost to the nation as a whole, it would devastate Medway and subject many across Kent to constant aircraft noise. Moreover, Heathrow could not continue to operate alongside a Thames Estuary airport, or airlines would not relocate from Heathrow to a much more expensive and less commercially attractive new airport. Airlines themselves have indicated that they are not prepared to move to an estuary airport from Heathrow – and are even less willing to pay for such a scheme. Therefore, for an estuary hub to work, Heathrow would have to be forcibly closed. How this would happen in practice is a question which remains unanswered and it has been suggested taxpayers would have to pay £20bn to compensate Heathrow and associated businesses. The closure of Heathrow would necessitate a shift of at least 75,000 directly employed staff to a Thames Estuary airport. No council in peacetime has ever been asked to re-home so many people and the implications of such a task would be almost unimaginable for our area. The site of the proposed airport is home to many internationally protected wildlife and environmental sites as well RSPB bird and nature sanctuaries. The likelihood of bird strikes on planes would be far higher than at other airports. 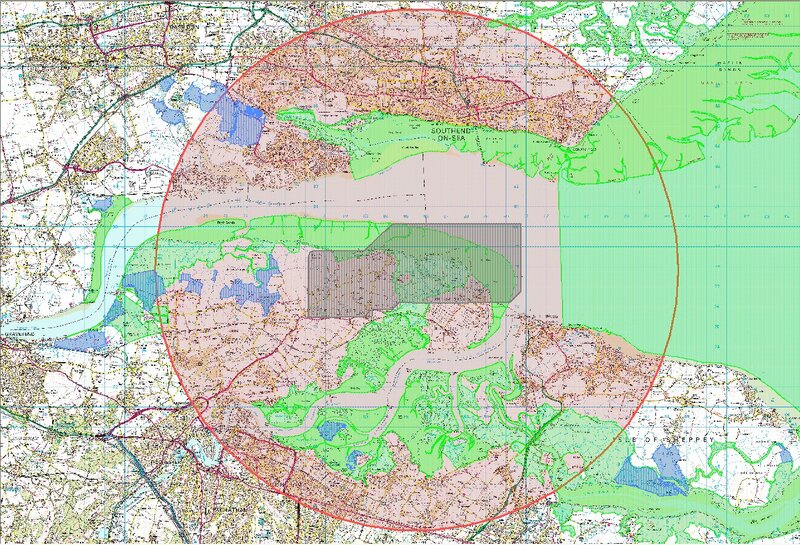 The location chosen for the estuary airport would not only be environmentally devastating, but on the wrong side of London for access from most of the UK, as well as being technically unfeasible in key respects. Richard Deakin, chief executive of air traffic management association, NATS, pointed out that four runways in the estuary would mean some approaches and departures being over London, compounding noise problems and conflicting with the flight paths of other airports, including Schipol. There are other far more realistic solutions for increasing airport capacity. If £5 billion were spent on a Crossrail spur from Stansted to Stratford this would link Stansted to the City in 25 minutes and to the West End or Ebbsfleet in 35 minutes, with Heathrow less than an hour away. Stansted is currently operating at only half its potential capacity and therefore could greatly increase its number of flights without even needing a new runway in the short-term. Gatwick is now pushing for a second runway once its planning agreement which prevents this expires in 2019. Expansion at Gatwick and/or Stansted with one becoming a hub which competes with Heathrow would benefit Kent with better connections.